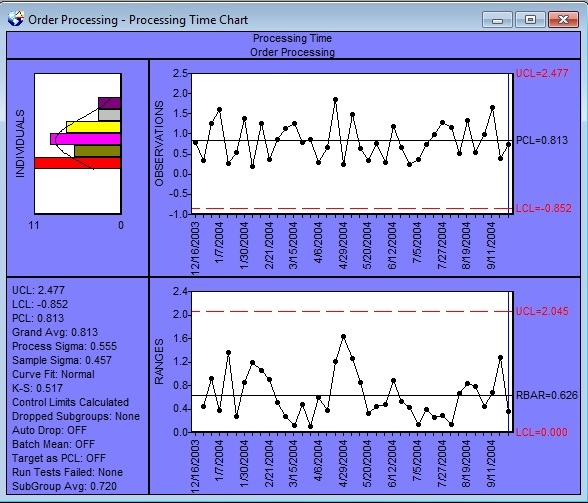 An Individual-X Moving Range Chart with process capability estimates from SPC IV Excel software. Individual-X / Moving Range charts are generally used when you cannot group measurements into rational subgroups, when it is more convenient to monitor actual observations rather than subgroup averages, or when the process distribution is very skewed or bounded. Each subgroup, consisting of a single observation, represents a "snapshot" of the process at a given point in time. The x-axes are time based, so that the charts show a history of the process. For this reason, you must have data that is time-ordered; that is, entered in the sequence from which it was generated. If this is not the case, then trends or shifts in the process may not be detected, but instead attributed to random (common cause) variation. If rational subgroups can be formed, the X-bar Charts are generally preferred, since the control limits are easily calculated using the Normal distribution. (See Distributions ). When process distributions are bounded or skewed, or when Rational Subgroups cannot be formed, then it is better to use a chart designed for individuals (n=1) data. The Individual-X Chart, however, requires that we know the distribution of the process, since this will define the statistical control limits. Instead, a Moving Average, EWMA or Cu Sum chart for individuals can be used to verify statistical control. 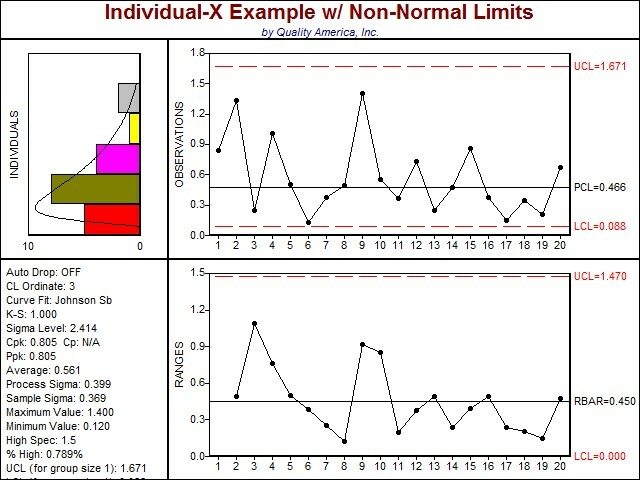 If control is evident, then a distribution can be fit to the individuals data for use in capability analysis and as control limits on the Individual-X chart, as shown in the figure below. Individual-X Charts are efficient at detecting relatively large shifts in the process average, typically shifts of +-3 sigma or larger. If X-bar charts can be used, then their larger subgroups will detect smaller shifts. Moving Average, EWMA and Cu Sum charts can provide higher sensitivity to smaller process shifts.